I spent what I can only hope will be Seattle’s hottest day this year touching base with some old tourist landmarks, beginning with the Pike Place Market. I came away with four good photos to reward my Saturday sweat. 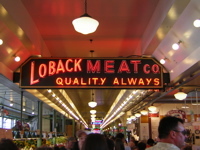 Loback Meat Company: Quality Always in the second picture. I always wanted to get a good clear photo of this. I didn’t want to use a flash, so I had to steady my hand to adjust for the slower shutter speed, and took three or four pictures propped against a nearby pillar. I like the backsplash of the red neon on the ceiling paint, and there’s something thematically appropriate about the steady sign contrasting with the blurred faces below. Finally, the old barefoot guy in shorts. I liked this man’s face, and the baby being pulled up the hill next to him.